Osteospermum are a popular perennial and look good in rustic or modern gardens. They love the sun and are evergreen. 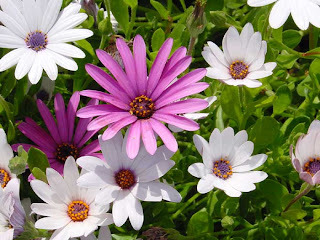 They flower from late spring to autumn and bear mauve-pink or magenta daisy looking flower heads. They have a dense mat of leaves which make good ground coverage. They grow to around 4-20 inches high and 20-36 inches wide. Grow in a sunny position in any well drained soil. Deadhead regularly to encourage new flowers and prolong flowering. If it is a particularly cold and wet winter they may not survive, to keep your cost down you can take cuttings from them at the end of summer and keep in a glass house or conservatory.